L’Artemise is one of the most luxurious boutique hotels in Uzès (Languedoc), an atmospheric walled town close to the Pont du Gard, Nîmes and Arles. The house in which the hotel is located, was constructed at the end of the 16th century and is set in a quiet garden with views over the Eure Valley and Mont Ventoux. 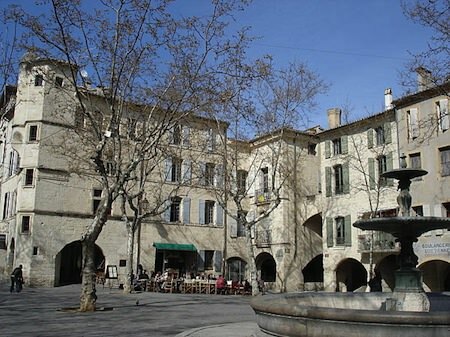 The centre of Uzès — the Place aux Herbes with its lively restaurants and cafes — are a few minutes walk from the hotel. Best of all, L’Artemise has a gourmet restaurant which serves dishes created from fresh seasonal produce; it offers the best wines from the region. They have a 35 EUR lunch menu and two dinner menus (55 EUR for 4 courses and 70 EUR for 5 courses). L’Artemise has 3 rooms and five suites, all with air conditioning, king-sized beds (2 meters long, so perfect for tall people), a large bathtub and a separate shower, a sitting room with a sofa and/or an armchair, a desk and a table, free WiFi, large plasma TV screen with satellite channels in several languages, kitchen area (with a refrigerator, microwave, electric plates, Nespresso coffee machine and kettle) and a safe. Pascal Morabito bath products, bathrobes, towels for the pool and flip-flops are available to all guests. They do not allow pets or kids under 15. If you feel like indulging in a massage or beauty treatment, head for the spa in the vaulted cellars of the basement. Down there you will even find a 10 metre heated pool, steambath, Jacuzzi, massage room and a gym. If you prefer swimming outdoors, the large pool (12×6 metres), isolated from the house to ensure guests are not disturbed by noise, is perfect for doing laps. What is striking about L’Artemise is the art work scattered across the rooms, suites and sitting areas. These include photography and videos from artists such as Georges Rousse, Olaf Breuning, David Lachapelle, Susan Derges, Gregory Crewdson, Erwin Olaf, Denis Rouvre, Shirin Neshat, and David Hockney. Uzès is a perfect base for exploring Languedoc, Nîmes, Arles and the Pont du Gard. It was the seat of the Dukes of Uzès who are the most important aristocratic family, next in line to the princes of the blood (the former royal family of France). The castle of the Dukes of Uzès is a must-see for visitors. Wandering through the narrow ancient streets of this walled town is such a pleasure on a lovely day and you will find that its chic boutiques and restaurants will keep you busy.